That, my friends, was a phrase I uttered nearly 84,326 times in this movie that lasted for two and a hours of my life. A movie in which, frankly speaking, I spent more time on my phone scrolling through Instagram than I do when I have more time on my hands that I know what to do with. Manasuku Nachindi is the kinda movie that would've come and sunk without a trace - and with no one the wiser, mind you - had it not been for the simple fact that the director of this movie is a certain Mahesh Babu's sister, Manjula Ghattamaneni, who's also given the story writing and screenplay credits. Hmm, what was that about jack of trades and king of none? The story starts out simply enough. 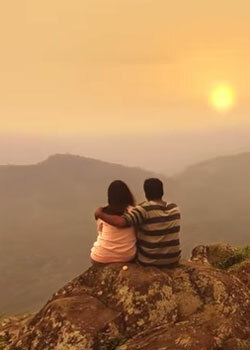 We meet Nithya (Amyra Dastur) and Suraj (Sundeep Kishan) just as they're about to be married off to each other by their very willing families - only they couldn't care less as they believe that they're only friends, strictly minus the benefits, and that their friendly affection towards each other has been mistaken for romance. Oh gee, such originality, much wow. Anyway, that causes the duo to run away to picturesque Goa with their friends, by which point the movie is starting to seem a lot like the Abhay Deol - Ayesha Takia starrer Socha Na Tha. Only difference being that Deol's producers did not believe in shamelessly piggybacking on his superstar uncle Dharmendra's fame, a moral Ghattamaneni should've been reminded of when she decided to rope in her celebrity brother to provide a voiceover as - get this - Nature, of all things. Yes, you said it, too. Good Lord. We soon find out that Dastur's Nithya is a nature-loving, inner-peace-seeking, Gaia-channeling maiden who responds to everything you throw at her with "feeeeeeel the lovvvvvve of naaaaature". Her partner-in-crime in this escapade, Suraj, is her polar opposite, of course - his sole aim in life is to become a fashion photographer and do photoshoots day in and day out for fame and feels of another kind. A meditation class run by Nithya brings them face to face with Nikki (Tridha Choudhary) and Jaanu (Baby Jahnavi). Suraj fancies Nikki from the get-go while Nithya comes across their cottage owner Abhay (Adith Arun), setting the stage up for the whole dating-others-and-eventually-realising-we-love-each-other scenario. You folks know how things wrap up in a story like this so let me not expand on that anymore should any of you decide to catch it (good luck with that). But suffice to say that by half-point, I'd already slid half-way down my seat, with the rest of the movie seeing me make up for the precious hours of sleep I'd lost trying to make it for the first day, first show of this film. The core problem behind Manasuku Nachindi doesn't lie in the idea - though that, too, is highly circumspect. But there is a verb known as execute, and one that the debutante director needs to familiarize herself with post-haste if she means to take up direction as a career. The story suffers terribly from shoddy pacing, and if you think we've been harsh with this review, you should've been there at the theatre when, at yet another ho-hum scene, people started jeering and clapping and hooting at the screen - you know the kind that comes out when someone's nerves have been frayed beyond a point. Also, barring those of the three main leads, no one's characters, not Nassar's, not Priyadarshi's, are fleshed out sufficiently enough to warrant attention, forget empathy. The only aspects worth mentioning here are, one, the cinematography by Ravi Yadav, which is truly breathtaking and reminds you of a Nat Geo documentary; two, the styling which includes zero objectification of women, courtesy a lady director perhaps; and three, child actor Jahnavi, the director's daughter and the superstar's niece, who puts in a good turn as a wise little pre-teen and can look at a career in the films once she's of age (should she be interested). All in all, a film that doesn't quite live up to the hype. Which reminds us, on our way out of the theatre, a battery of reporters were accosting folks willy-nilly, trying to find out their "opinion" of the movie. And while we slyly walked away from the media circus lest we be forced into giving our "honest" opinion to the reporters and be hunted down by Mahesh Babu fans later, we did honestly tell the parking lot assistant when asked about the movie - manasuki assalu nachaledu. Execute - verb; Execution - Noun. Thank you for that. Will get that changed pronto. fullhyd.com has 700,000+ monthly visits. Tell Hyderabad what you feel about Manasuku Nachindi!